Septic Tank Prince George | Services | Blockbuster Drain & Sewer Service Ltd. If you rely on a septic tank for your waste needs, it’s important to maintain your system with regular maintenance and inspections. At Blockbuster, we provide a wide range of septic services including septic tank installation, cleaning, pump replacement, and camera inspections. When it comes to septic tanks, we have the knowledge and experience to keep your system operating at peak efficiency. Please note that we do not provide sales of septic tanks. A properly installed sewage disposal system consisting of a septic tank and absorption field or Lagoon should, with proper care and maintenance, provide many years of service. The following information will assist you to enhance your system’s performance and extend its useful life. Have the septic tank pumped out every 2 years or as required. Pumping will vary as to size, usage, and recommended daily flow. 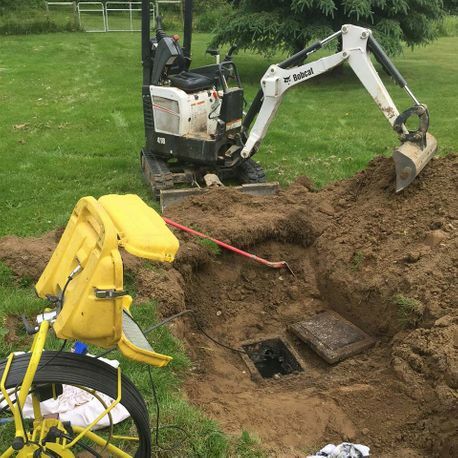 Failure to pump out a septic tank when it is required may result in sludge or scum to be carried over into absorption field resulting in soil clogging and complete failure of the system. Practice water conservation using low flow fixtures (toilets, faucets, shower heads, dishwasher, and laundry machines). Use only bio-degradable toilet paper. Take all hazardous waste to an approved disposal facility. Become familiar with your onsite sewage system components but do not attempt to fix or alter them in any way. Keep children and animals away from the Sewage Disposal System. For the overall performance of your system, please notify your Registered Onsite Wastewater Practitioner (maintenance provider) of any changes to the property, including but not limited to outbuildings, workshops, greenhouse, landscaping, hot tubs, fish ponds, deck, proposed structural changes, or additions to the building. Do not use a garburator. It will overload the septic tank, degrade wastewater treatment, and decrease drain field life. Do not use powdered laundry detergents. Minimize use of bleach and cleaning products. Do not allow roof drains to discharge to the septic tank or surface waters to drain toward the area of the dispersal field. Do not drain wastewater from hot tub or swimming pool into sewage disposal system. Do not park vehicles, drive, or allow livestock to make a pathway on septic lines or over the dispersal area. In the winter, snow cover is very important to maintain a cover of natural insulation to prevent freezing. It is recommended that a snow fence or other suitable barrier be placed around the absorption field to discourage any traffic on the area. Do not discharge water treatment devices including water softeners into system. IMPORTANT: Do not attempt to fix or alter your sewage system. If you are having problems please contact us.